In a recent project for the New Zealand business community, we were required to have some really custom routes. An example of such routes would be geographical routes, e.g. /china, or /china/beijing. Note we can have negative matches as well. I’m sure the Regular expressions gods can do a negative match use Regexp only, but hey. We found this rails idiom to be quite useful as this allows us full customisation of routing, if we need it. We have used it successfully for Made from New Zealand, so you check it out on pages such as www.madefromnewzealand.com/new-zealand and www.madefromnewzealand.com/new-zealand/auckland. Pastie of the code here. ZoomIn is 3 years today ! 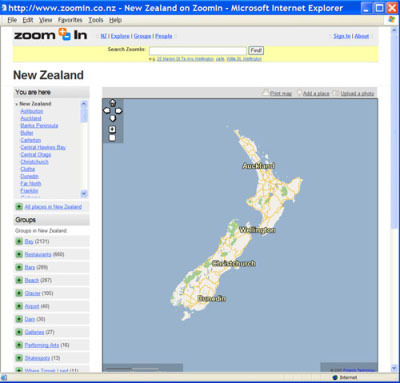 October 29th in 2005, ZoomIn was launched to the world. Currently we have 78734 places and 11558 users on ZoomIn ! Thanks to everyone who has contributed to ZoomIn. 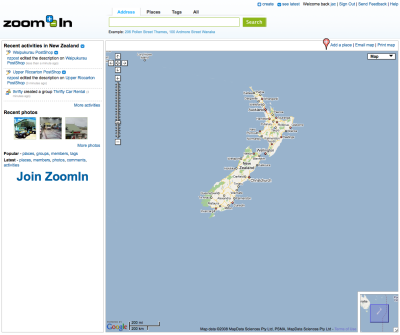 ZoomIn has come a long way since that date, here’s a look at some the changes that have happened over the last 3 years.